This is my great grandfather, Thomas Aaron Magill. I don’t have any living relatives old enough to remember him, but recently, as I’ve been doing some digital repairs to his photograph, something about his eyes has made me want to find out who he was, conjure a human being out of ancient history. I’m indebted to my mum’s cousin Tom Magill, son of Thomas’s son Joe, for his genealogical research and for recording his late father’s memories. I’ve tried to create a reasonably chronological life story out of Tom’s notes and family charts, supplemented by a little internet research to expand on a few points. Thomas – Tommy – was born on 31 March 1880 to William Magill, a bricklayer, and Rebecca Jane Magill, née Vallely, in 35 Blenheim Street, Belfast – Rebecca’s father’s house. William was 24, Rebecca 22. They already had a son, James, born two years earlier. The Magills came from east Antrim, possibly Carrickfergus or Larne. Thomas’s son Joe would later recall that some of his forebears came from the village of Bonnybefore, east of Eden, in the parish of Carrickfergus. Apparently the road from the village to the main road is called Magill Avenue. Rebecca died in 1883 at 112 Crimea Street, Belfast. The listing for Crimea Street in the 1880 Belfast Street Directory is “a number of small houses”, no numbers given, so I suspect it was a bit of a slum. William married again – his second wife’s name was Elizabeth West – but died in 1886 at 7 Townsend Street. James, eight, and Tommy, six, were raised by their grandparents. This would be either William’s father James William Magill and stepmother Mary, née Bodell, or Rebecca’s father, Thomas Vallely, and mother, who’s name I don’t know. Tommy was apparently difficult. At about 16 he struck his grandfather during an argument, “perhaps over the issue of frequently being given ‘Elder’ sandwiches in his ‘piece box'”, writes Tom. I don’t know how serious that’s meant to be. Anyway, while Tommy was out at work his grandparents moved house. The family fallout was profound and long-lasting. His aunt Margaret Magill, who founded Christian Endeavour Ireland, would have nothing to do with him. His son Joe would grow up barely knowing his cousins. Tommy moved to the Shankill Road area where he took lodgings at 7 Crimea Street. There he met Jane English, who was living nearby at 3 Morpeth Street. Jane came from a Carrickfergus family that may have been distantly related to the Magills, and they had apparently known each other in childhood. On 27 December 1899 they were married in the Mariner’s Church on Corporation Street, Belfast. Tommy was 19, Jane 18. Their first child, Agnes, was born on 17 October 1900, but only lived six weeks. 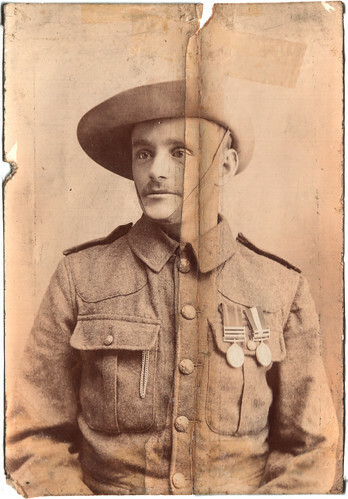 Tommy fought in the Second Boer War, originally as a private in the 99th Company (Irish), 8th Battalion of the Imperial Yeomanry, later as a trooper in the 74th (Dublin) Company. The Imperial Yeomanry was a volunteer mounted infantry regiment raised in 1900 by Royal Warrant for service in that war. The 99th was in the first contingent, which arrived in South Africa in the first half of 1900. He would have had to supply his own horse and convince the colonel he could ride and shoot, but recruiting was a bit of a rush job and many of the Yeomanry sailed not being able to do either. The 1901 census, presumably completed by Jane, shows their address as Springfield Village, Dundee Street in north Belfast. He was awarded the Queen’s South Africa Medal with three clasps: Cape Colony (a “state” clasp awarded to those who served in a particular state but did not take part in a particular battle which had its own clasp), Queen’s South Africa 1901 (for service between 1 January and 31 December 1901) and Queen’s South Africa 1902 (for service between 1 January and 31 May 1902). In his photo he’s shown wearing two medals. The second was identified by Col. Begbie as the King’s South Africa Medal, for service before December 1900. I had previously believed he only served with the 74th, which was in the second contingent and didn’t arrive in South Africa until May 1901, and speculated that this might have been a borrowed medal. Since then my distant cousin Bobby Magill has provided evidence he was originally in the 99th, so he almost certainly was in South Africa long enough to earn this medal. He returned to Belfast in 1902, receiving an honourable discharge on 7 September. His discharge papers describe him as being 22 years and 7 months old, 5ft 4in tall, with brown hair and eyes, a “fresh complexion” and a tattoo on his left arm. His conduct was classed as “very good”. He took a job at Harland & Wolff shipyard. A Thomas Magill, driller, is listed at 17 Dundee Street in the 1902 Belfast Street Directory. His and Jane’s second child, Tommy junior, was born on 5 December. They were now living in Railway Street, off Sandy Row in south Belfast. Another son, Joe, was born in 1906, and another, John, in 1909. By 1910, when Joe started school, they had moved to 26 Lisavon Street in east Belfast, but they must have been living there as lodgers, as the householder was a blacksmith called Alexander Boyd. Two more sons, James and Andrew, were born in 1911 and 1912. Tommy’s life seems to have gone off the rails. One one occasion seventy years later his son Joe would “burst into tears at the memory of his father’s self-centredness, gambling, drinking, etc.” On one occasion he was sacked from the shipyard for physically threatening a foreman over a demand for “blood money”, and was lucky that his big brother James was a foreman stager in the Queen’s Yard and rehired him, despite the apparent antipathy between them. James died of tuberculosis in 1911, aged 33, and Joe recalls his father taking him on a rare visit to the extended family in Eighth Street around this time. They missed the last tram home and caught a ‘Jaunting Car’, and Joe remembers falling asleep on his father’s shoulder. Both Tommy and James are believed to have worked on the Titanic. Tommy actually sailed on the Titanic on her maiden voyage in 1912, but got off at Southampton. One version of the story is that he tried to get a job in the engine room, but failed, disembarked and went home. Another version is that he did have a job as a stoker, but he and six other stokers, known as the “Black Gang”, slipped off the ship in Southampton for a drink in a harbour bar, heard the siren and got back just as the ship was about to sail, but weren`t allowed back on board because the officer on the gangway door thought they were last-minute stowaways. There`s a Thomas McGill listed as a trimmer in the crew for the delivery trip from Belfast to Southampton, who was previously on the engine crew of the Olympic, on Encyclopedia Titanica, although he seems a couple of years too young. One of the men who stayed on board and went down with the ship was greaser Joseph Beattie, a friend after whom Tommy named his second son. He was back in Belfast by September, when he signed the Ulster Covenant against Home Rule, giving his address as 26 Lisavon Street. Jane signed the accompanying Declaration for women, but was living with her mother in 32 Lindsay Street off the Ormeau Road. In the Belfast Street Directories from then on Mrs Jane Magill is the named householder, in 67 Skipton Street in 1914 and 1915, 69 Skipton Street from 1916-1932, and in 276 Albertbridge Road from 1934 until her death in 1966. Three of their sons – Andrew in 1913, James in 1914, and John of typhoid fever in 1917 – died over the next five years. Joe also contracted typhoid, but survived. On 1 July 1916 Jane’s brother Alexander (Sandy) was killed in the Battle of the Somme. On 29 March 1917, as near as dammit exactly nine months later, Tommy and Jane’s youngest son, my grandfather Alec, was born, and Tommy is listed as living with Jane in 69 Skipton Street on his birth certificate. A momentary reconciliation borne of military tragedy, perhaps. Perhaps there was still something between them. It wouldn’t last. My mum remembers Alec, her dad, telling her of the rare occasions his big brothers took him to see his dad. Joe told Tom how Tommy was often keen to see his sons and would bring them bags of apples, but would often meet them drunk. In 1930 Tommy was living at a hostel at Carrick House, Lower Regent Street. On 26 August, at the age of 50, he was killed in an industrial accident at the shipyard. He was drilling funnel plates, while a colleague was operating the crane, lifting plates into position. The plates should have been shored up with planks until they could be bolted together, but on this occasion they hadn’t been, and a loose plate, weighing about 1000 lb (450 kg) fell on him from behind. The noise of the drill drowned out the warning shouted by another worker. He died from fractured ribs, a ruptured kidney and internal bleeding. The inquest heard that platers on this job were working on “the ‘piece’ system… [which] tended them to take risks they would not have otherwise taken.” The coroner returned a verdict of accidental death. For the rest of her life Jane would never refer to him by name, only as “the oul’ fella”. She had worked night and day as a dressmaker to feed her children, and in those days there was no compensation for industrial accidents. It was a long time since he’d given her anything but grief. The photo top left is, as far as anyone in my family is aware, the only one of him in existence, and it had been torn in half. We can easily empathise with Jane for having to bury four of her seven children, and look on Tommy as a poor husband. But it’s easy to forget that they were his children too. We can look at his life and see all his failures, but I believe we can detect mitigating circumstances. He was a difficult teenager, but many of us are, and losing his parents so young, and being kicked out by his grandparents in his teens, must have damaged him. The Boer War was a nasty conflict with a high mortality rate, both from combat and disease, and he must have lost friends and had to do terrible things. I wonder how much of his adult bad behaviour stemmed from his war experience. Since Vietnam we’ve all become aware how difficult combat veterans are to live with, and back then who would have thought of offering Tommy any help to readjust? Even now soldiers don’t get much help or understanding, and a frightening number of them end up homeless, alcoholic, drug-addicted or suicidal. Shipbuilding was a dangerous industry, as evidenced by Tommy’s eventual fate, and he must have lost friends in similar accidents. He certainly lost one friend, maybe more, when the Titanic went down. Working class men had it tough in the old days. We often hear that women had it tough, and it’s true, and it can be tempting to think men must have had it easy. But it’s instructive to reflect on the hardships men had. War and heavy industry put your life, and those of your friends, at constant risk: in both arenas you were expendable. The high level of infant mortality must have been heartbreaking for fathers just as it was for mothers. Tommy and Jane’s lives were both characterised by loss. Jane evidently handled it better than Tommy did, but by all accounts it made her hard. She adored her grandchildren, but hated her daughters-in-law, and she was bitter about her husband until the day she died, so we can’t say her life left her unscathed. We also only really have her side of the story, via her children and grandchildren, who were far closer to her than they were to Tommy. I now know much more about the circumstances and events of Tommy’s life, but I can’t really say I’m that much closer to understanding Tommy the man. This entry was posted on Saturday, July 7th, 2007 at 1:10 am	and is filed under Friends and family. You can follow any responses to this entry through the RSS 2.0 feed. You can leave a response, or trackback from your own site. That’s great to have all that info on him. Hi Patrick! My brother forwarded this site to me. We’re descended from James Magill, Thomas’s older brother – he was our great-grandfather. And Tom Magill (your mum’s cousin) goes to the same church as my husband and me. We were under the impression that the grandparents that brought up James and Thomas were the Magill grandparents. I think that’s what Tom said, anyway. Anyway, keep up the research. The article was a good read. Hi Julie – always good to meet a relative. I’ll drop you an email about my family history research. That is interesting – I’ll have to do some digging and see if I can find any connection between your Magills and mine. The McConnell-Brown connection is particularly intriguing. The Magills are my mother’s family, and the Browns are my father’s. My paternal grandmother’s mother was Sarah Jane McConnell, daughter of Trevor. She married Rainey Mills, and their daughter Annie Mills, my grandmother, married my grandfather Jack Brown – although they didn’t get married until 1940, so 1920 may be a bit early for the families to know each other. Drop me a line – my email’s on the “about” page. I’ll let you have access to my family history website, and we can compare notes. I know Thomas’s mother was Rebecca Jane Vallely, and her father was Thomas Vallely, but I don’t know what her mother’s name was. But names often run in families, so it’s very possible that there’s a connection. Thanks for giving me a name to look for. I’ll get back to you if I find anything. My great grandfather, Thomas Joseph Magill went from Larne Ireland to Canada. He first stopped in Manitoba the Saskatchewan and finally British Columbia. Our branch of the Magills married into the Agnew family who had Kilwaughter Castle. Just found your reply. Could not find your email address on the about page. Would be pleased to exchange McConnell information. Our branch left Ireland in 1874 to come to Australia, but there were still, mcconnell and Magill relatives around Larne. I am James Magill’s great grandson, and I have a great interest in the Magill family history. I think I have solved the problem of when Tommy arrived in S Africa. He was originally in the 99th Irish Imperial Yeomanry and was transferred to the 74th Dublin when they arrived in S Africa. I have a document which confirms this. So he was in S Africa in time to qualify for the medals. I hope this helps clarify the issue. Hi Bobby – that is interesting. Do you know what the other medal is? My grandmothers grandmother was Jane Magill who worked in a large house just outside of Carrickfergus.